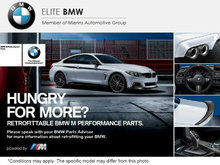 Elite BMW offers its clients a wide range of incentives and promotions on new and Pre-Owned Certified Series® BMW models, as well as regular rebates at its Service department and Genuine BMW Parts and Accessories department. Watch for seasonal promotions, including on the installation of winter or summer tires. 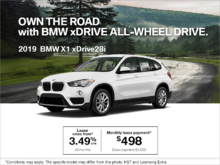 Take advantage of BMW's great incentives as well as low finance and lease rates on new BMW models! Owning a new BMW is more affordable than you may think. 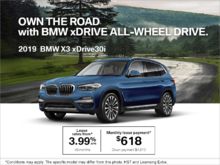 For those in the market for a pre-owned model, BMW Financial Services also offers affordable financing rates and flexible payment options on Pre-Owned Certified Series® BMW models. All promotions are updated regularly. Come back often to see current incentives and rebates. You can also give us a call at 1 855 728-4019 or contact us by filling out an online contact form.